WHAT IS COVERED UNDER CalMark’s WARRANTY? The warranty covers both “Materials and Workmanship”. All the components of your cover have a 6 year, deterioration & defect warranty. If any of the components fail during the warranty period, due to normal wear and tear, but not related to wind and friction damage, become unserviceable because of lost strength from normal exposure conditions, including sunlight, mildew, rot and atmospheric chemicals, CalMark will repair your cover at no charge. YOU will be responsible for shipping charges to and from our factory in Oxnard, CA., for ALL warranty repair services. CalMark Cover Co. Inc. reserves the right to repair/alter or partially replace only the fabric that becomes unserviceable, from normal use under the terms of CalMark Cover Co. 6 year – limited warranty. Each and every cover is uniquely made, designed and hand made for your Recreational Vehicle. Therefore, repairs and alterations are treated in the same individual way. In the event that there is human error (due to our unique Hand Made custom manufacturing methods) and your CalMark Custom Cover is not made correctly to the specifications that you have provided us with (or that we have measured for you, or have established patterns) your cover will be altered to rectify the fit and CalMark WILL pay for shipping to and from our factory in Oxnard, CA. CalMark will NOT entirely replace the whole cover. CalMark WILL partially replace necessary areas to achieve the designed outcome and corrected fit. WHAT IS NOT COVERED UNDER CalMark’s WARRANTY? The warranty does NOT cover tears, wear spots and abrasion to the fabric caused by wind, sharp objects, friction or tie downs. It is extremely important that you take precautionary steps to protect your cover from sharp or protruding areas, prior to installation, to assist the life of your cover beyond its warranty. Refer to Installation tips for further details. 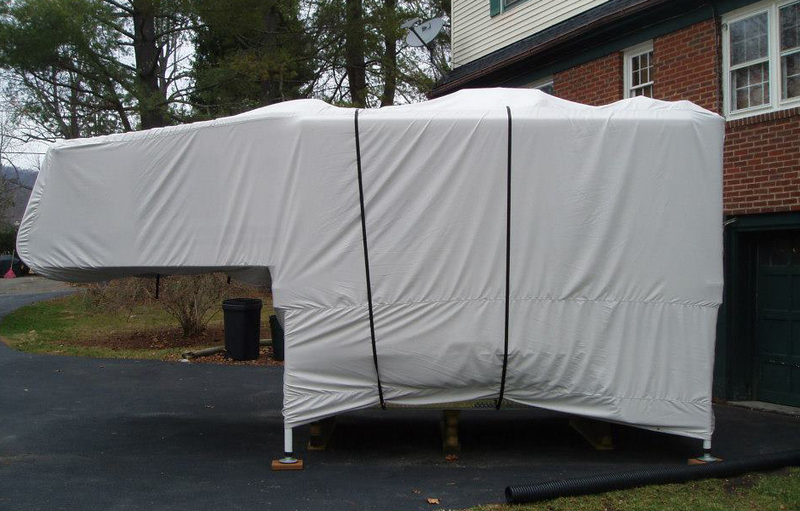 Moving your Recreational Vehicle with the cover on will terminate your warranty. The warranty is also voided if the cover is modified in any way outside of the CalMark factory. This warranty is not transferable and does not cover normal wear and tear, weathering or damage caused by improper use. In the event that there is human error and you have provided us with inaccurate measurements and your CalMark Custom Cover does not fit, CalMark WILL alter your cover to rectify the fit, at no charge to you, however YOU will be responsible for shipping your cover to and from our factory in Oxnard, CA. CalMark will NOT entirely replace the whole cover. CalMark WILL partially replace necessary areas to achieve the designed outcome and corrected fit. 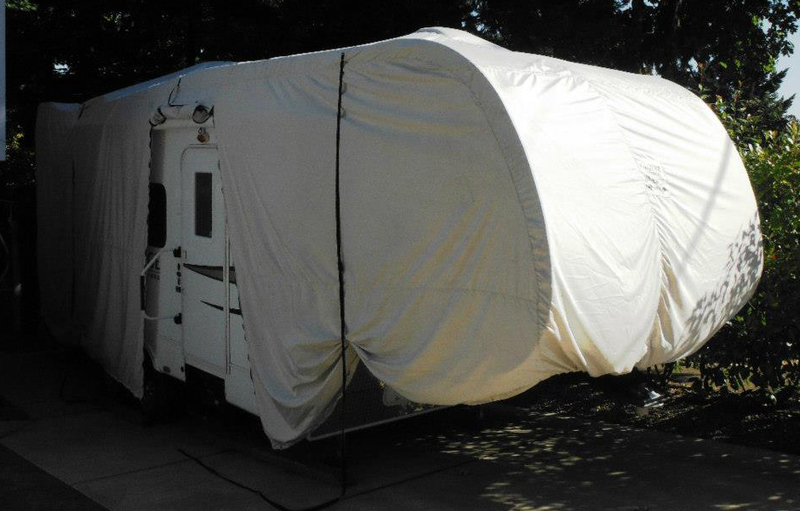 Your CalMark cover will NOT prevent hail damage, to your RV or to the cover itself, and it is not covered under CalMark’s warranty.